Ruthless Performance Motorsports has the aftermarket turbo kits you need to improve your car or bike's performance. 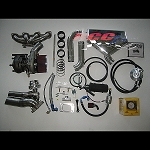 Featuring turbo kits from RCC Turbos, Trask Performance, Hahn Racecraft, Treadstone Performance, Hellion Power Systems, and many more, builders have been coming to us for the best turbo systems that money has to offer. Upgrade your ride and get more horsepower to leave your competition in the dust. Our motorcycle and car turbo kits come with various options to suit your needs for a truly customized ride. Our kits are backed with a limited warranty for quality you can trust. RCC 1999-2007 Suzuki Hayabusa RACE Turbo Kit. Will produce approximately 550HP!!!! RCC 1999-2007 Suzuki Hayabusa 650HP SUPER ULTRA Turbo Kit. This kit is capable of 650HP! Billet Aluminum Water/Air Intercooled Plenum!!! RCC 1999-2007 Suzuki Hayabusa Stage 2 Turbo Kit. 425 HP. RCC 2008-2014 Suzuki Hayabusa RACE Turbo Kit. Will produce approximately 550HP!!!! RCC 2008-2014 Suzuki Hayabusa 550HP ULTRA Turbo Kit. This kit is capable of 550HP! Billet Aluminum Water/Air Intercooled Plenum!!! RCC 2008-2014 Suzuki Hayabusa ULTRA Turbo Kit. This kit is capable of 550HP! Billet Aluminum Water/Air Intercooled Plenum!! !